According to the Sony Classical label which released it, the soundtrack album for Deadpool 2 is the first score soundtrack in history to be released with a “parental advisory” warning on its front cover. That alone was reason enough to check out the movie, the score and the album, and composer Tyler Bates was kind enough to spend a few minutes talking, and laughing, about it for this story in Variety. Bates, perhaps best known for his Guardians of the Galaxy scores, invited director David Leitch to pen a few profane lyrics — entirely appropriate for the endlessly irreverent comic-book hero — for a Hollywood choir to sing. 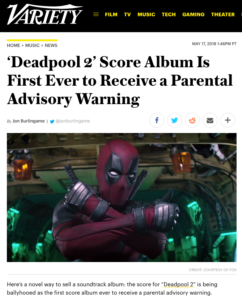 This entry was posted in Composers, Film Music, Interviews and tagged David Leitch, Deadpool 2, profane lyrics, Sony Classical, soundtrack albums, Tyler Bates, Variety on May 17, 2018 by Jon Burlingame.